In 2014, the Government released a video called “The school revolution” in which, among other things, they took you through changes in the types of schools and showed the way children were learning. The video started and finished with Dan Abramson, who is the Head of Kings College Mathematics School, showing a simple method of calculating both arithmetically and algebraically. When using it he said “multiplication is area”, hence my title. What he was actually using was grid multiplying, so I thought I would use the same idea to show how simple it is using grid multiplying to find some general rules for arithmetic. The answer consists of 80×80 + 80 + (80 + 1) or 80² + 80 + 81. It would seem that to move from one square to the next, we simply add the 80 and the 81 to the original answer. Is this always true? To try it, we can simply use the symbol “n” to stand for any number. This tells us that, yes, (n+1)² = n² + n + (n + 1) is always true. In fact, since we haven’t assumed n to stand for a whole number, it will also be true, for example, that 5.7² = 4.7² + 4.7 + 5.7. What if we are multiplying two different numbers? Will there still be a rule for adding 1 to each number? Let’s start with 31 × 21. It would seem that 31 × 21 comes to 30 × 20 + 30 + 20 + 1? Is this a general pattern? Fortunately, we can use the same sort of grid to multiply, for example, (a + 1) by (b + 1). This follows the same pattern. (a + 1) × (b + 1) = ab + a + b + 1. This means, for example, if I know that 15 × 30 = 450, then 16 × 31 = 450 + 15 + 30 + 1 = 450 + 46 = 496... and, yes, I chose this calculation deliberately to show that the Mersenne prime 31, when multiplied by 16, gives the Perfect number 496. As a final example, I will find a pattern for squaring a number ending in a half – like 6½ × 6½. 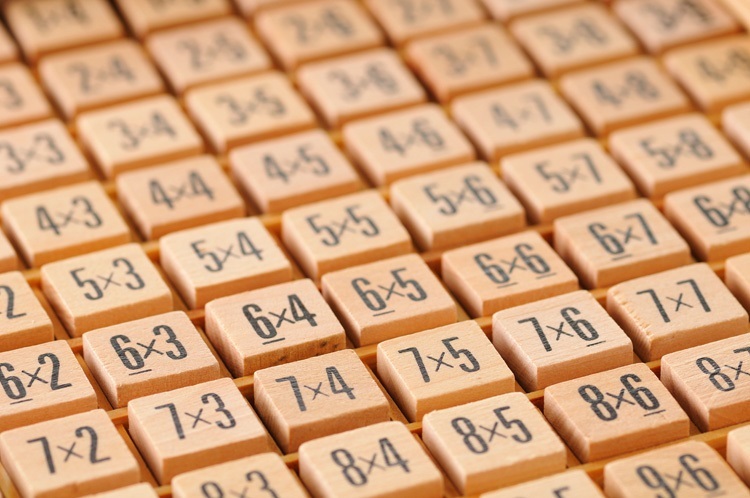 What we get is 6×6 + 3 + 3 + ¼, which we can simplify to 6×6 + 6×1 + ¼ or 6×7 + ¼ = 42¼. Basically, this is saying that squaring 6½ seems to give 6×7 + ¼. Is this always true? 3½² = (3×4) with ¼ on the end making 12¼.